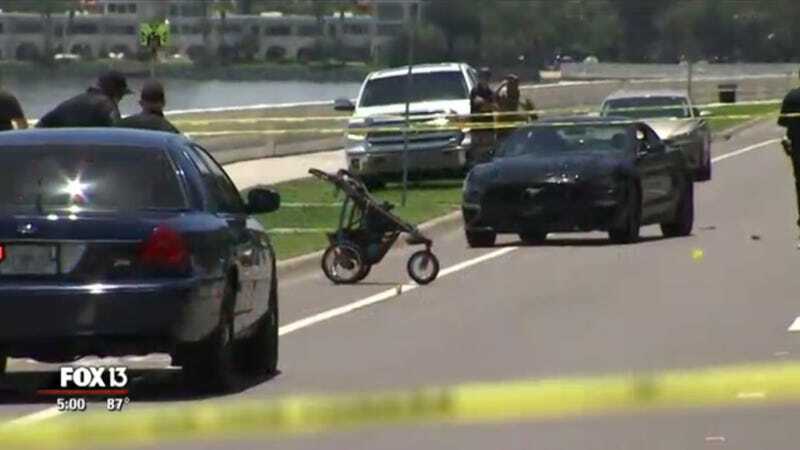 An arrest warrant for a street racing Ford Mustang driver shows that the driver was going 102 mph before hitting a mother pushing her child in a stroller last week in Tampa, Florida, reports the Tampa Bay Times. The speed limit on the road was only 40 mph, and both the mother and child died as a result of their injuries. Mustang driver Cameron Herrin, 18, was street racing a gold Nissan Altima belonging to John Barrineau, 17, at the time of the May 23 crash. Cameron’s 20-year-old brother Tristan Herrin was also riding in the Mustang at the time of the crash. All three men were arrested. Jessica Raubenolt, 24, was legally crossing Bayshore Boulevard in Tampa, Florida, with her 21-month-old daughter Lillia in a stroller when the two were struck by Herrin’s Mustang. The warrant states that Herrin reached speeds of 102 mph before slamming on the brakes, but braking wasn’t enough to avoid hitting Raubenolt and her child. Police were able to determine the speed using electronic data pulled from Herrin’s Mustang, according to the Tampa Bay Times. Raubenolt died shortly after being transported to a hospital. Her daughter was taken to the hospital in critical condition but later succumbed to her injuries. The two drivers now each face two counts of vehicular homicide and street racing, and passenger Tristan Herrin faces a misdemeanor charge of racing. This should go without saying, but don’t do this, ever. There are legal venues out there to go racing where you won’t get arrested, or worse. There is zero reason why a mother legally crossing the road should be in any danger from cars that are going too fast to stop in time for a simple pedestrian crossing. Roads and the paths around them are designed to work at certain speeds, even if you fancy yourself a faster, better driver. Take it to a real track, or don’t race at all.